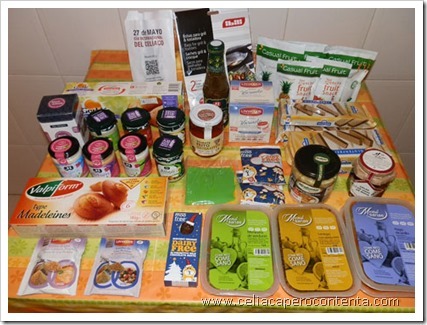 The product is manufactured in Spain by a company in Barcelona called “Snack Saludable, S.L.” and is sold in their own online store, in many stores in Catalonia and in the fruit section of Alcampo and Eleclerc hypermarkets. 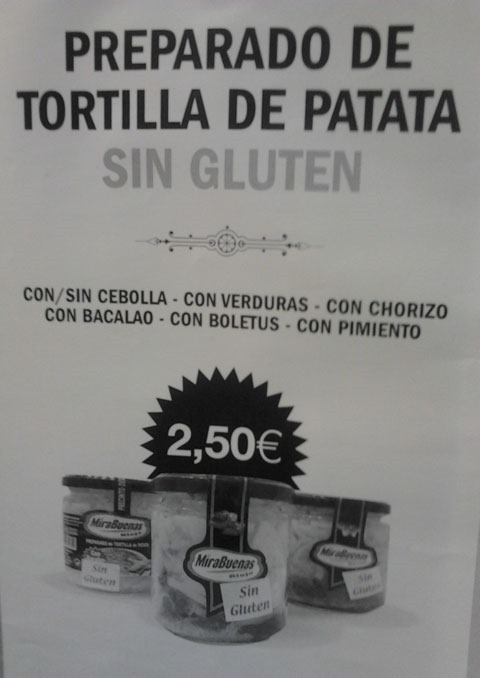 I had read before about this gluten-free cereal originated in Ethiopia, but now it is grown and sold in Spain. The company Saluteff sells it in two formats: flour and flakes. Teff is a natural source of proteins, minerals, amino-acids, vitamins and fiber. You can consume it daily adding a spoonful of flakes to yogurts, juices or shakes. I tried the flakes and reminded me of the wheat bran that I use to add to home made bread, years ago when I was not celiac. The gluten-free diet is poor in fiber so I guess it’s a good complement. You can buy it in their online store and on their web there are recipes that use this cereal to prepare bread, hamburgers, Ethiopian bread, pancakes and so on. If you want to know more about this cereal look in You Tube, there are many videos about it. Have you tried Teff? Please tell us. At the stand of my friends Ana and David from Foody, besides catching up, I discovered a few new things. What I liked the most is a little bag to toast bread without contamination. They also can be used to heat a small pizza slide. They are made with a material that resists high temperatures and they can be reused around 30 to 40 times. I bought a two unit pack for 2,90 Eur. 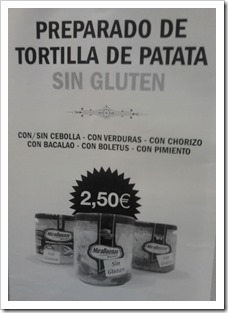 At the stand of my friend Iñaki from the Eco-Diet store (Logroño, La Rioja), besides tasting their delicious pâtés, I found something new that I loved: a gluten-free mix to prepare “tortilla de patatas” (Spanish omelette). It contains fried potatoes and, depending on the choice, onion, vegetables, chorizo, cod or boletus. You just have to add 3 or 4 eggs, according to your personal preference and in a few minutes your tortilla is ready. Iñaki says it’s very good. We haven’t tried it yet but we’ll let you know as soon as we do. 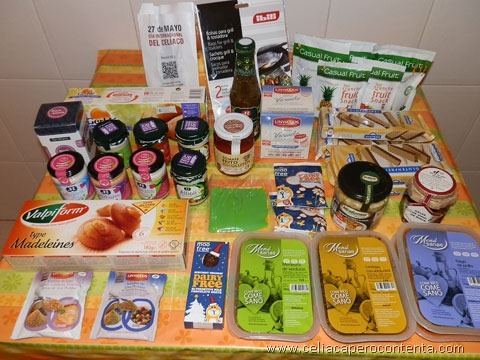 More and More independent producers are also making gluten-free products. 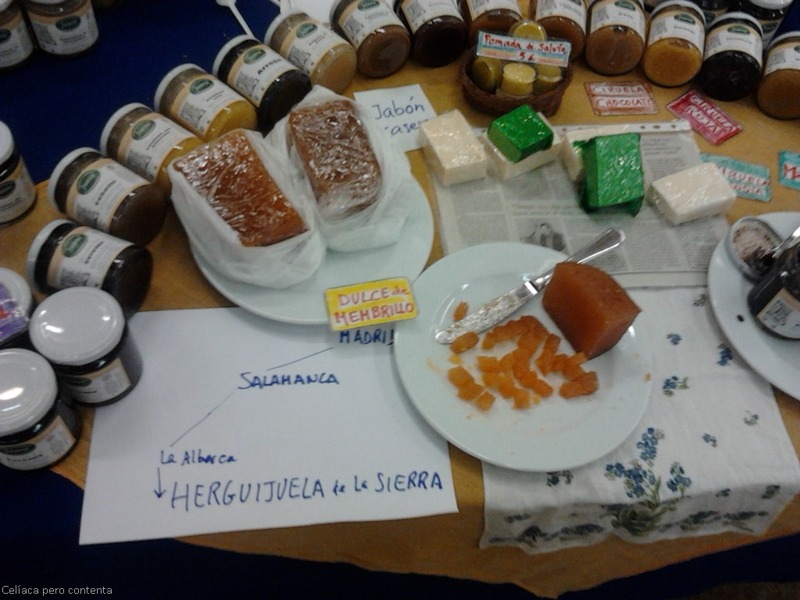 That’s the case of Juana Cerezo from the town of Herguijuela de la Sierra, Salamanca, who produces an amazing variety of marmalades, made with fruit from her own trees. There are from the traditional ones like apple, peach, fig or onion, to interesting mixes like pumpkin with coconut or tomato with apple. I tried cherry and it was yummy. To end for today I will talk about chocolate. 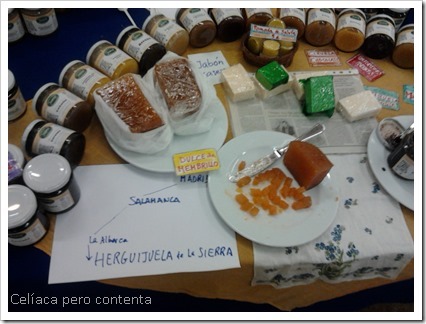 I visited one of my favorites, a place that have been mentioned before in our blog: Marqués Confectionery from Gijón, Asturias. I took this opportunity to talk with my friend Alejandro Álvarez (owner) and eat a little of their fabulous gluten free chocolate. Another chocolate I tasted and I didn’t know before was from the artisan workshop Chocolate Natural San Lázaro, from Rascafría, Madrid. Their products don’t contain added vegetable or animal fat, egg, gluten, coloring or preservatives. They also produce sugar free chocolate for diabetics. I can say that their black chocolate tablet is delicious.